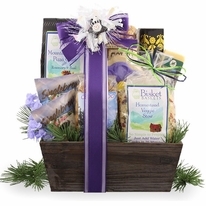 Bellagio Gourmet Hot Cocoa Mix Box 1.25 Oz. 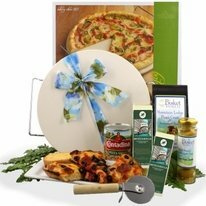 Contadina Pizza Sauce with Roma Style Tomato�s 15 oz. 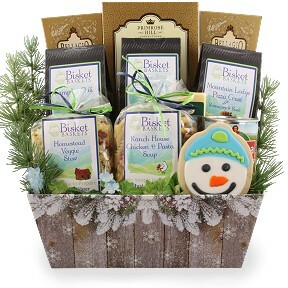 Comfort food gifts are a delightful gift to both send and receive. 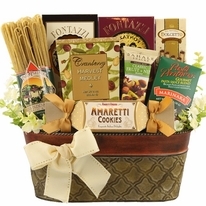 Four delicious meals and multiple snacks can be found inside this family food basket. Homestead Veggie Stew, Mountain Lodge Pizza, Campfire Chili with Snake Bite Beer Bread and Ranch House Chicken all tucked inside a beautiful rustic themed container. 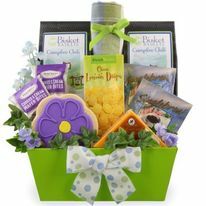 This gift has many occasions for giving like an appreciation gift, sympathy gift, congratulatory gift and more.